The feeling that Pesach was approaching was so tangible, it permeated our home long before Pesach. My mother was so excited to start cleaning! I remember how she would tell us that as we are physically cleaning for Pesach, we are spiritually cleaning the chametz out of our bodies. We all remember how, as Seder night approached, my mother would tell us that we were all princes and princesses of the King of all kings and how important we all were. The Seder table was set with the most beautiful dishes, and we were all dressed so royally. There was so much excitement in the air! After I was married, I remember going to my parents for Pesach, when my oldest was not even two years old, and I had a small infant. I told my mother that I wanted to put the kids to bed before the Seder started so that I could relax and enjoy the Seder. The table was already set for so many people. I would be seeing so many relatives, and I was looking forward to Seder night! But my mother told me that it was so important for the little ones to be part of the Seder, even if it was only for a short time. She emphasized that even though they were so little, it would be good for them and their chinuch [education] to be present. She said that they would feel something special that they could remember for a long time and that it would influence on them. This really taught me a lesson about education. Even for such young children, valuable impressions and memories are being made! My mother would reminisce how as a child she would beg her mother to be able to stay up to take down the Pesach dishes and wash them. It was such a happy time; she felt so privileged to be able to take part in the avodas hakodesh, the holy work, of cleaning the refrigerator, cleaning the dishes and setting the table for Yom Tov. This also impressed on me how education begins at such a young age. What an experience it was to go to my parents’ home for the Yom Tov meals! It was like going to the most heartfelt lesson on how lucky we were to have such a loving, caring Father in Heaven, Hashem, Who gave us the most beautiful and valuable gift in the whole world, the holy Torah, and how fortunate we were to be Jews. The very last Pesach of my mother’s life, when my mother was very ill, we, her children, thought that it would be a nice idea to buy my parents a gift before Pesach. We knew that whenever we bought a beautiful dish for their Shabbos and Yom Tov table, my mother would experience tremendous excitement. She was so delighted to use it to beautify Shabbos, and told us what nachas it gives the Holy One when we use things in His honor. Even though my parents had one already, we decided to buy them an even nicer, more elaborate Seder plate. It made her so happy to use that beautiful Seder plate that year. It was well worth the investment in kibud em, giving honor to our mother, seeing how truly delighted she was! Preparing for Pesach B’simchah! 40 Lifesaving Lessons to Help you make it to the Finish Line! 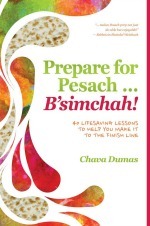 by Chava Dumas explains how to make and live Pesach with depth and joy. Thanks for publishing this. I was privileged to know Rebbetzin Rosenthal when she lived in Baltimore. She was an inspiration to me.